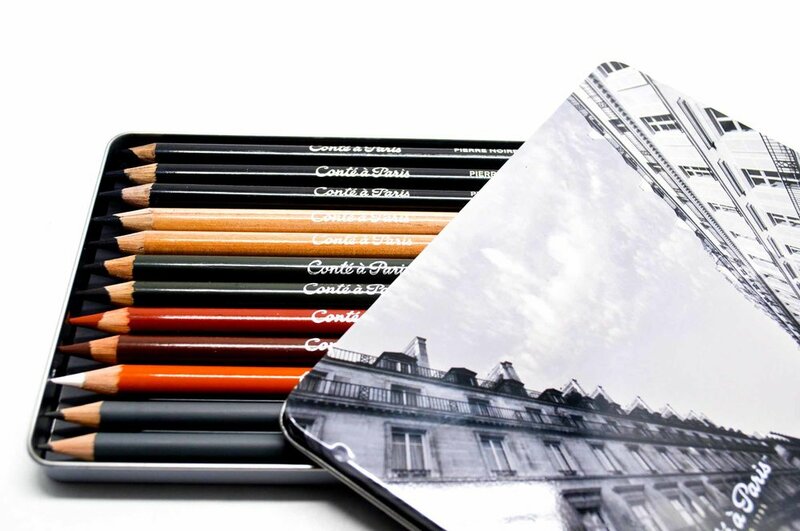 In this review I am taking a look at the Conte à Paris Sketch set. 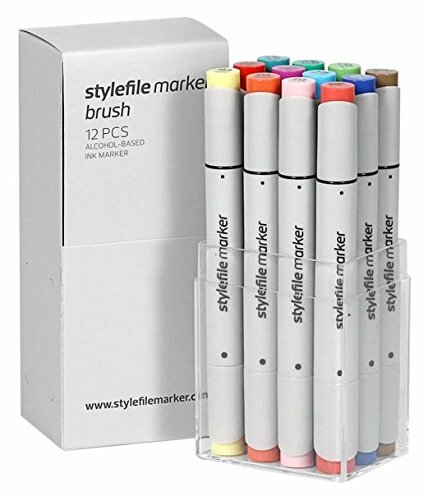 A lot of pencil manufactures have created sketch sets, consisting of a unique range of charcoal, graphite and pastel pencils. If you take a look through Instagram or Pinterest, you will see a lot of beautiful art work created with such sets, primarily portraiture, body images, botanical and still life. I actually have a few sets of pastel pencils and graphite pencils by conte to review, one of the things I really love about the pencils is the overall dimensions, the barrels are really quite chunky and feel really good in the hand. With the Conte Sketch Set, the barrel is an awesome 8.5mm sporting an incredibly generous 5mm core. 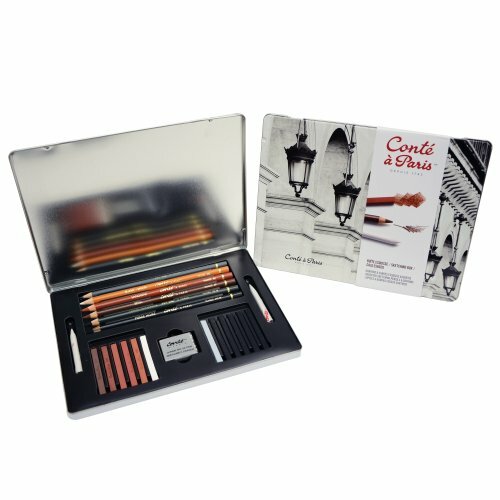 Inside this Conte à Paris Sketch set, there are 5 different types of pencils with two or three pencils from each range. The first two pencils in the Conte Sketch Set are your ordinary graphite pencils, Conte have provided an HB and 2B. Next are three pastel pencils, a white or as the French call it “Blanc”, then there is a Sanguine pastel pencil follow with the Sepia colored pastel pencil. 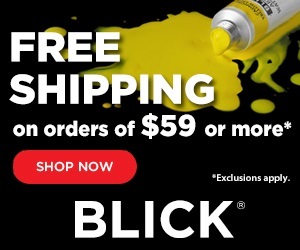 After that there are two “Fusain Charcoal pencils and they are graded HB and 2B, I have to be honest, when I first seen these pencils I had to look up what a Fusain Charcoal pencil was. For those of you that know this, I bow to your knowledge, however for those of you like me, Fusain refers to a fossilised Charcoal. Next in the Conte Sketch Set there is two Carbone pencils, an HB or 3B and then finally there are three Pierre Noire pencils, an H, B and 3B grades. 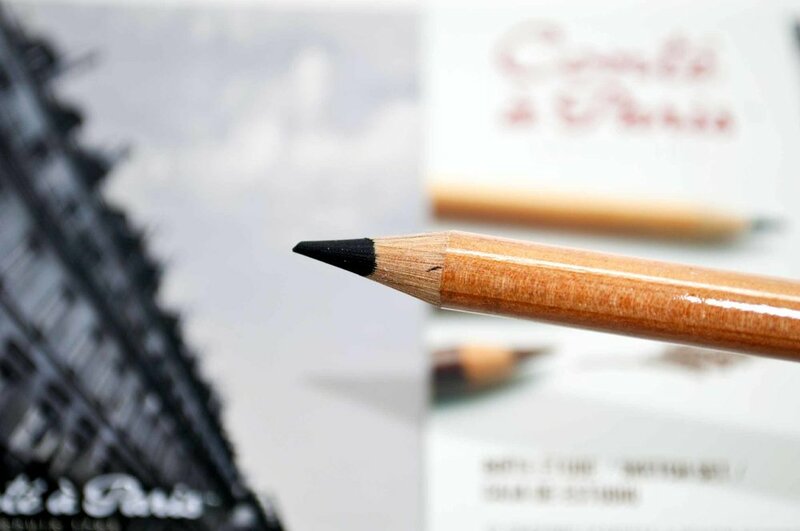 Along the barrels of each pencil, regardless of the type, the all have printed the company name “Conte à Paris”, followed by the name of the pencil, Graphite, Blanc, Sanguine, Sepia, Fusain Charcoal, Carbone or Pierre Noire. After this is the grade of the pencil HB or B etc, followed by the country of origin for Conte which is “France”. Finally each pencil has a number printed which is for open stock purposes and reordering. As I have already highlighted, there are five different type of pencils in the Sketch Set, with each brand displaying a uniquely different performance. The first two pencils are the HB and 2B Graphite pencils, the Conte graphite is a really smooth consistency, sometimes graphite pencils can be a little bit gritty, however this is not the case with both the Conte Graphite. Next are the three pastel pencils, the white, sanguine and sepia, these three colors are very popular in sketching sets. All three colors are perfect for lose sketches, nudes and landscapes. 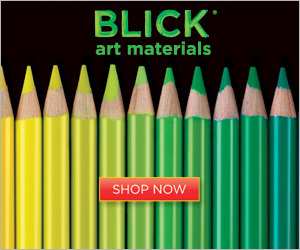 As pastel pencils the pigments are incredibly strong and the lay down pigment is smooth and consistent. I have a full set of Conte Pastel Pencils that I will be conducting a full and detailed review of very soon. Next is the Fusain Charcoal, as I mentioned, I had never heard of this and had to look it up online, regardless of what exactly it is in terms of Charcoal, the actual lay down of the core acts slightly different to ordinary charcoal pencils. With both the Fusain Charcoal pencils in the Conte Sketch Set, they don’t appear to be as powdery as other charcoal pencils I have used in the past. There is a similar chalky feel, but the outcome is very different. Next is the Carbone pencils, both the HB and 3B are incredibly dark considering how low down the scale they are. 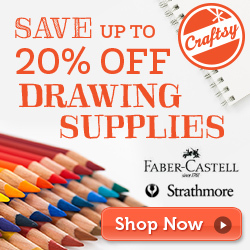 A few graphite sets on the market now include one or two Carbone pencils. Carbone is much darker than traditional graphite and unlike graphite, there is no shine, no reflection from the light. 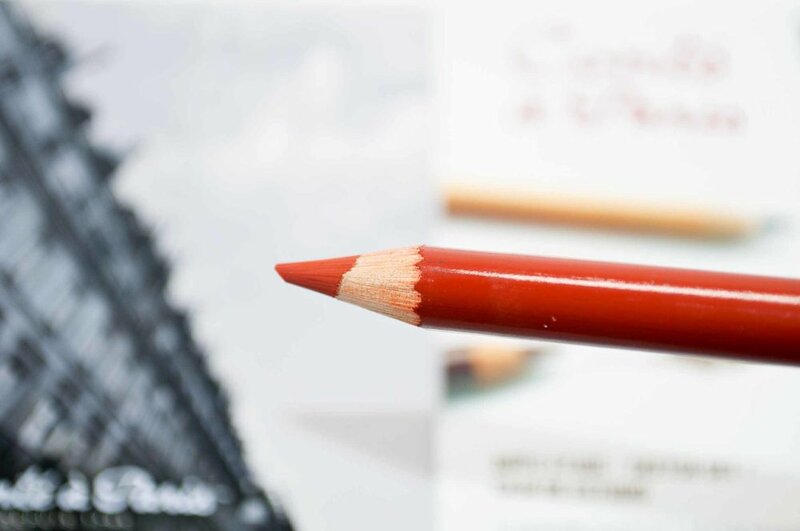 The Carbone pencils are used by graphite artists to get incredibly dark tones without running the risk of that metallic look when the light reflects off it. 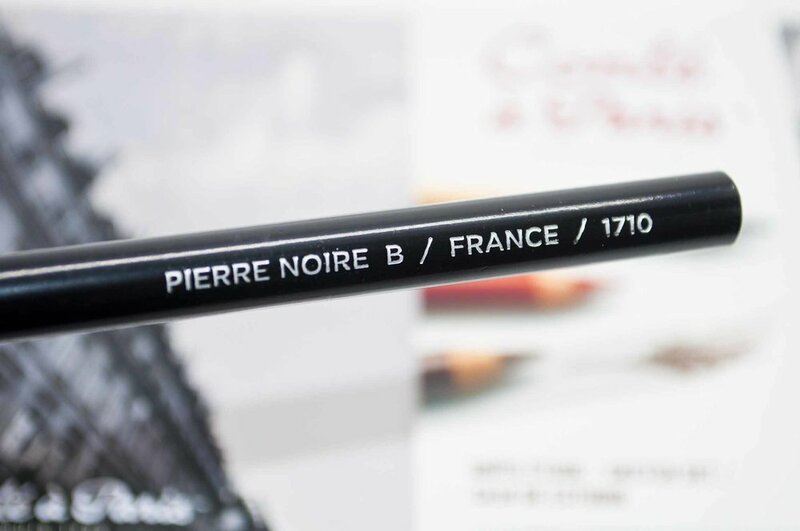 The Pierre Noire pencils are really strange, but strange in a good way, all three pencils graded H, B and 3B, given that one of them is H, a considerably light grade in Graphite, the Pierre Noire pencils are incredibly dark with a matt finish. 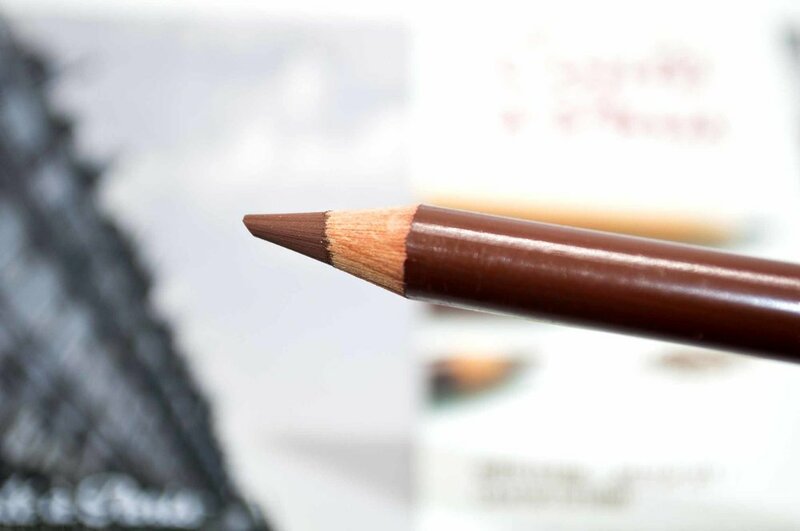 However, if you were to have you eyes closed and used a Pierre Noire for the first time, you would think by the feel of the core on paper, that you were using a soft wax pencil. Although many pencil companies have their own versions of Sketch Set with a similar arrangement of pencils, they are all pretty much a 12 set of pencils, one or two of the companies have a 24 set, but I have never seen one larger than 24. 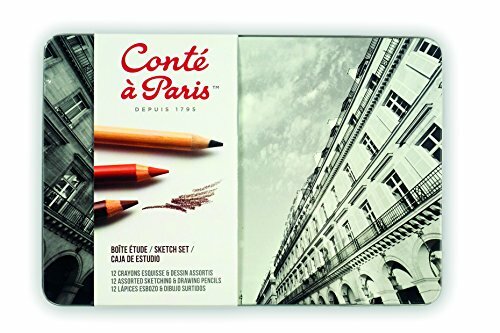 In the case of the Conte à Paris set, the largest set is 12, however, the pencils can also be purchased open stock and various arrangements of small blister packs can be purchased. 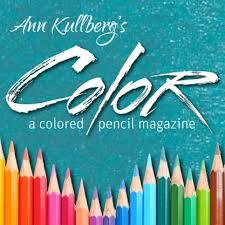 Conte also have a Sketching Box, which comprises of 6 pencils of various grades, 6 pastel block, 6 charcoal blocks, a kneaded eraser and two blending stumps. 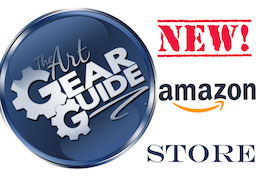 Unfortunately at the time of writing this article, I was unable to locate any of the above sets on Amazon.com, that being said, I will continue to search and as soon as they appear I will add the links to the article. I have wanted to try a set like this for such a long time, test and review them for you, ever since I seen so many wonderful works of art using sets similar to the Conte à Paris Sketch Set. I think given how inexpensive they are and the excellent arrangement of charcoals, graphite and pastel shades available, all creative minds should have at least one of these sets. I have added a YouTube video review of this set over on my channel so to take a better look at them, I would love for you to check out the video.